La Salle, IL. 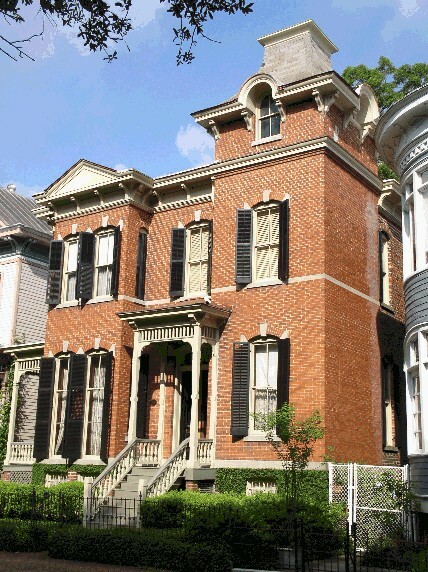 Hegeler Carus Mansion, c. 1876, with full Second-Empire form, styling and Mansard roof. Photo donated by Sharon Wagenknecht, Executive Director of the Hegeler Carus Foundation which operates the property as a house museum and maintains a detailed Web site. Photo by Nels Akerlund. This structure was designated as a National Historic Landmark in 2007. PERIOD OF POPULARITY: 1860s – 1880s, most popular during the 1870s after the Civil War. 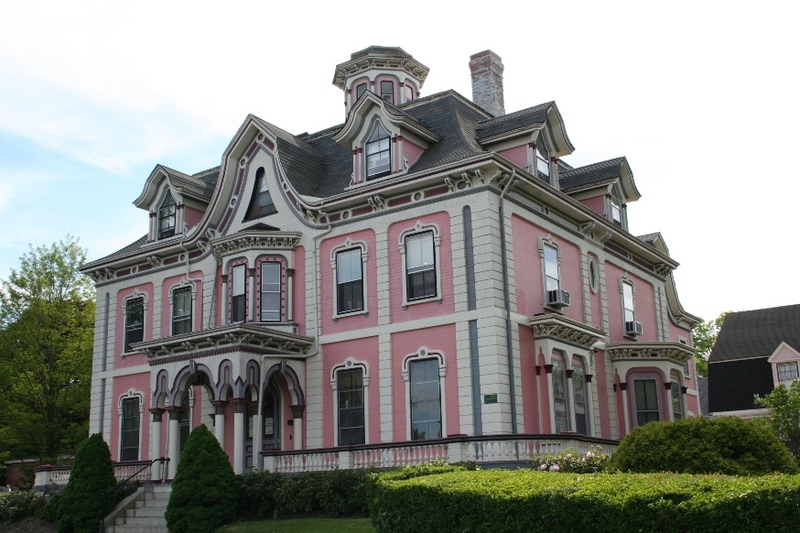 IDENTIFYING FEATURES: Basically Italianate style and massing with a Mansard roof. 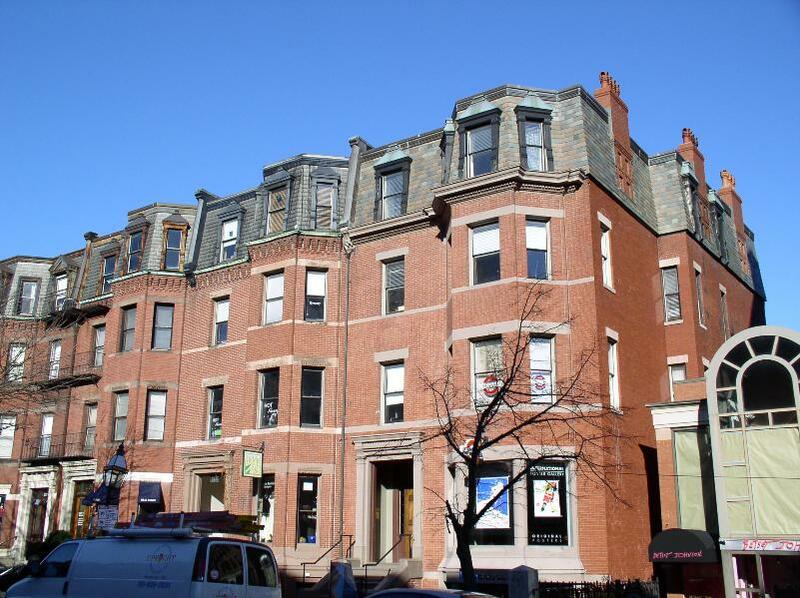 The Mansard is the key feature that typically allows for a quick identification. Often includes dormer windows in the upper floor, providing light behind the Mansard roof. Sometimes includes a square, central tower, decorative brackets, and molded cornice. Expect to see similar Italianate details on and around windows and doors. The floor plan often includes pavilions, which are outward projections of a building’s center or side. BACKGROUND AND INSPIRATION: More formally referred to as French Second Empire, this was the first true style of the Victorian era in the United States, if we do not include the preceding Romantic era. The style was most popular in the Northeast and Midwest, but rare in the South. 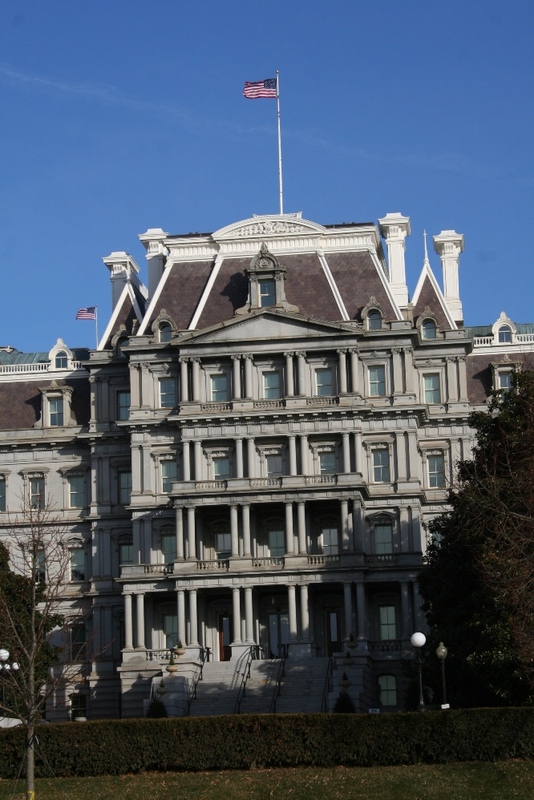 It also became known as the “General Grant style” due to its use during the Grant administration for public buildings. The term, Second Empire refers directly to the style’s inspiration in France, particularly to the reign of Napoleon III (1852-1870) who undertook a major building campaign to transform Paris into a city of grand boulevards and monumental buildings. The urban redesign and Renaissance-inspired architecture of Napoleon’s Paris was subsequently copied and applied throughout Europe and North America. Napoleon’s famous project was the enlargement of the Louvre (1852-1857), which reintroduced the Mansard roof, developed during the 1600’s Renaissance by Francois Mansart. By the 1860s the style diffused from France to Britain, and into the United States by way of Boston – at that time America’s cultural capital. For More photos of Second Empire style, Click Here. Washington, D.C. Old Executive Office Building, c.1871 (began construction). Designed by Alfred B. Mullett (1834-1890). Mirroring national trends, newer construction in Washington, D.C. following the Civil War rejected earlier Federal and Greek Revival designs in favor of modern stylistic modes. Initially called the State, War, and Navy Building, the design revealed that Americans were learning of a progressive new style in the Paris of Napoleon III. This building became one of America’s three grandest structures to represent the then-modern style. Silverton, CO. 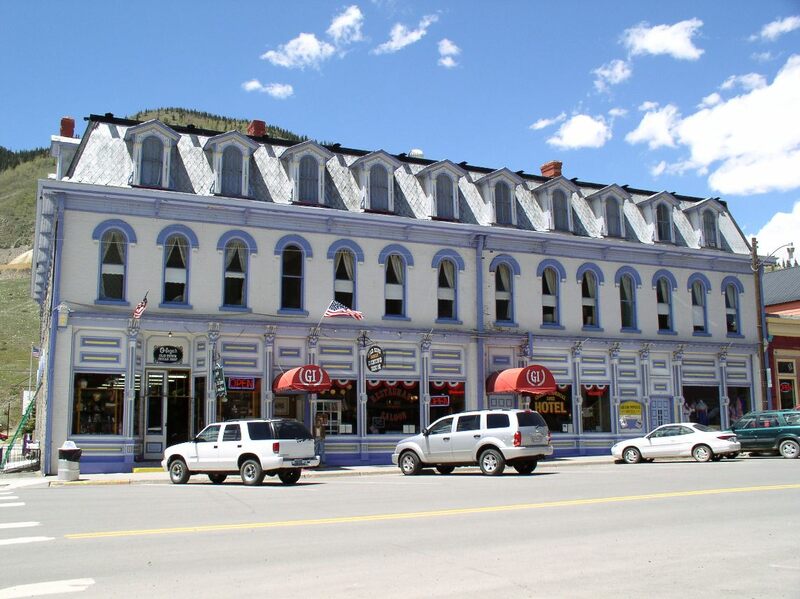 The Second Empire style showed up on western main streets like this one, about a decade later than in the East. Boston, MA. Townhouses with pavilions and Mansard roof. Savannah, GA. c.1886. 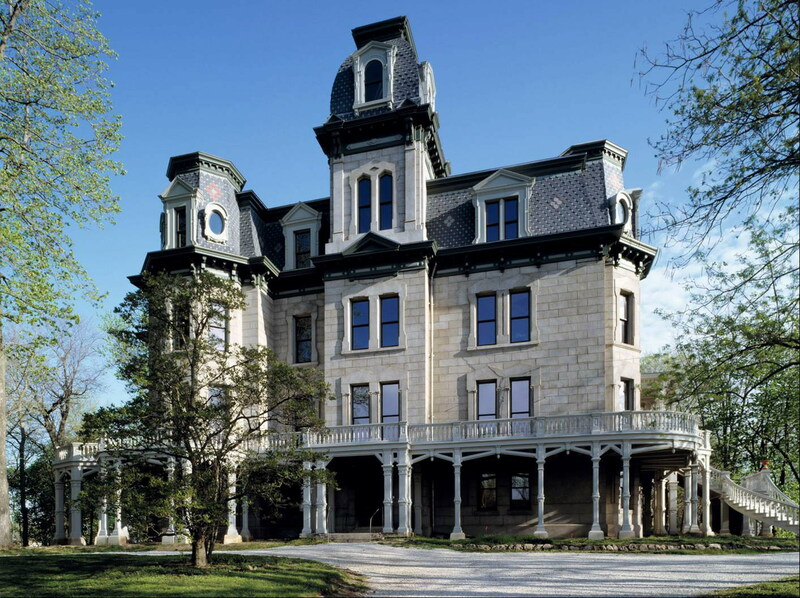 Excellent example of pavilions (projecting parts of building on both sides of porch), square tower, and Mansard roof.